The non-motorized boater outreach project seeks to engage non-motorized boaters through a combination of mass market outreach combined with one-on-one interactions with boaters. ISAN focuses on several regions to tackle this work: the Greater Yellowstone Area, the Grand Canyon, and nationwide. One-on-one interactions with non-motorized boaters help to emphasize that they have a role in AIS transport and an awareness of the action they need to take to avoid spread. With this in mind, ISAN reaches non-motorized boaters in a number of ways. First, ISAN employees and volunteers attend regional whitewater festivals and other water-related events. Second, ISAN is working to enable permitted river managers throughout the West to adequately teach and engage permit-holding recreationists. 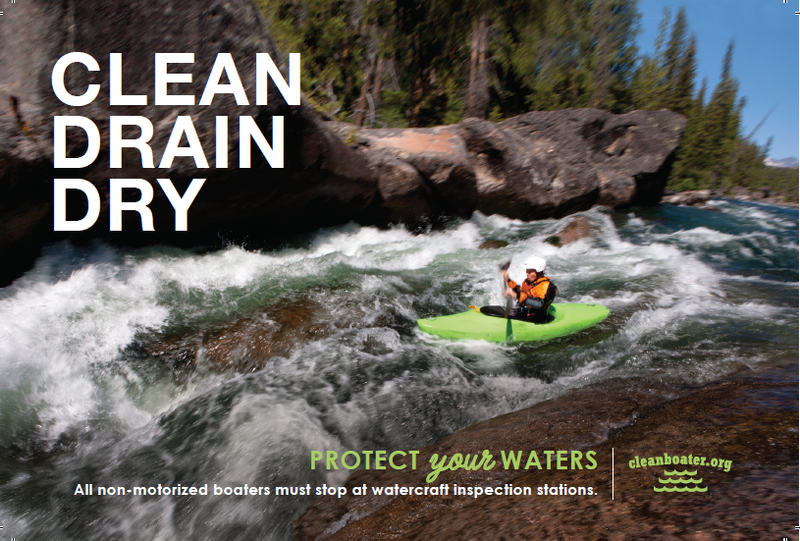 Third, ISAN and non-motorized boating manufacturers throughout the US work collaboratively to ensure that non-motorized boating customers receive Clean, Drain, Dry message with each purchase. To become a Non-Motorized Boating Partner Manufacturer, please contact marya@stopais.org.